Mercedes boss Toto Wolff has defended Lewis Hamilton at the end of a tumultuous weekend for the reigning world champion. Briton Hamilton ended his troubled Suzuka weekend - which culminated in Mercedes winning the constructors' world championship - by deleting a Tweet referring to an "idiot". Earlier, he was in a standoff with the media, he messed up the start of Sunday's Japanese grand prix, and he failed to get past Max Verstappen at the end of the race. Mercedes protested Verstappen's alleged movement under braking, but via Twitter, Hamilton denied the protest had even been lodged and referred to an "idiot" who started the story. However, the story was true, and Hamilton subsequently deleted the Tweet. Mercedes then withdrew the protest, but when asked about Hamilton's tumultuous Suzuka weekend off the track, team boss Wolff said: "Let him do his talking on the track. "His performances in the car justify some collateral damage." Team chairman Niki Lauda thinks it is now almost "impossible" for Hamilton to win the title, but Wolff denied that his driver is now effectively in meltdown. 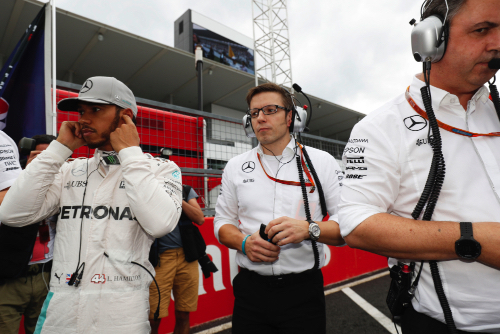 "In Malaysia, Lewis dominated the weekend but then there was the engine failure which was not easy to cope with. "Then there were all these events related to the (Thursday) press conference, but I don't think that affected him at the start. After that, he had a great race." So Wolff tipped Hamilton to bounce back soon, and played down any suggestion the 31-year-old should be reprimanded for detracting from Mercedes' championship win. "After such a race, it is not the right moment to really put the finger where it hurts. "In my experience of the last few years, the situation often looks completely different after 24 hours," he said. "Our main goal is to help Lewis, but there are ten days until Austin so there is no need to hurry -- unlike last week. "At the same time, it is true that Lewis works best under pressure and when he has a target, so I have no doubt it will be a tough fight until the very end. "We are still very far from being able to say that it is over."